These are just suggested and what we commonly work with. We also do custom flavors. However, not all flavors are available for all cake types. Meringue butter cream: Light and rich at the same time and not too sweet. This delectable butter cream is the standard. Mousseline butter cream: A bit richer and more flavorful than the meringue butter cream. This one incorporates egg yolks as well. Not recommended for hot outdoor temperatures. Rolled Fondant: A pliable sugar dough that is used to coat and decorate cakes. It tastes like marshmallows, but is also available in white chocolate and chocolate. *We use high-quality single-origin chocolate. You may choose any of the butter creams as a filling as well as the items below. Fresh fruit or compote: Not available for all cake choices. Honey and Vanilla: Very strong floral notes. Chocolate: Made with single-origin chocolate. 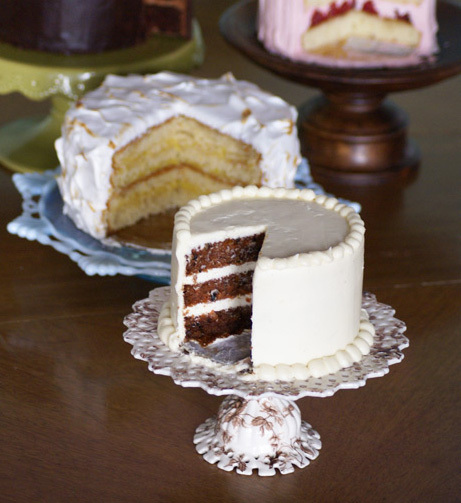 Classic vanilla: Vanilla cake with vanilla bean or French vanilla butter cream. Decadent chocolate: For true chocolate lovers- Decadent chocolate cake with Mousseline chocolate butter cream or ganache. Neapolitan: Alternating layers of strawberry, chocolate and white cake, filled and frosted with vanilla butter cream. Can substitute Pistachio for chocolate. Tropical: Rum cake with mango or passion fruit curd and coconut butter cream. Winter: Chocolate cinnamon cake with praline butter cream. PB & J: Yellow cake filled with fruit preserves or jam and frosted with peanut butter butter cream. Lemon: Lemon cake with lemon butter cream. *These are seasonal flavors. There is an extra charge for these flavors out of season.